I haven’t read a Stephen King novel in many years. Probably the last was It. Even that is hard to say because he is so prolific. My favorite work was always “The Body” in Different Seasons. Admittedly Pet Cemetery and Misery were much scarier, but The Body is a beautiful atmospheric coming of age story with a bit of the creepiness (and the basis for Stand by Me). 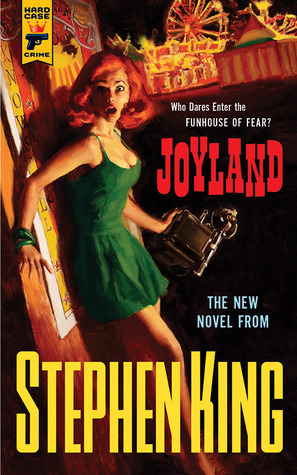 With his new novel, Joyland, part of the Hard Case Crime series, King creates another fine story about the fall of innocence. Joyland is about a young college student in the 1970s who decides to spend a summer away from his northern university and his lukewarm girlfriend. He gets a job at an amusement park called Joyland (more like a carnival) in North Carolina that also happens to have a dark story lurking in its horror house along with a ghost. After the summer season, he decides to take a break from school (and seeing his ex) and stays on at the park. In the meantime he meets a local family that has a big impact on his life and on Joyland. Again, this is the atmospheric coming of age Stephen King at his best. It is nicely edited, the perfect length, and avoids most of the typical King excesses (see It). Not much more I can say beyond that you should read it. I’m going to finish this freaking Cannonball if it kills me. Or if I have to read YA. Not such a bad thing, but I have a lot of reviews to write. So here is review #26. This will be the hardest teaser summary to write because the plot was all over the place. Basically, we are in England of 1985 where the country is in a perennial war with Russia over the Crimea, Wales has seceded to become a (sort of?) communist state, and the English populace is freaking mad about great authors, especially Shakespeare. Our main character, Thursday Next, is a Special Operations detective for the LiteraTech department that seems to focus mainly on great book forgeries. She gets involved in the investigation of a really bad dude named Hades. Why does she get involved? Well, because she’s special, of course. And chaos ensues, which includes worm holes (I think), time bending, dodo birds, and Thursday jumping into the plot of Jane Eyre … WTF? As you can see from the Goodreads reviews, people seem to either adore these books (it is a series) or hate them with a passion. I enjoyed the world the author created, but felt like there were too many holes in the story, too many plot points that didn’t make a bit of sense. Plus, Thursday as she became more and more gooey about her long lost love really lost my attention. I just wanted her to get married and stop the whining. Nevertheless, if I don’t think too hard about it, the book was admittedly fun to read and honestly I might read another. I really liked the dodo birds. Looking for an alternate reality detective story that involves great books, but goes by quickly? Thursday Next just might be the gal for you. It is so hard to write a review of a book I didn’t quite like. I’m still going strong for Cannonball Read though and should probably persevere. I picked up The Vault by Ruth Rendell randomly one day thinking it looked good from the cover and the jacket description. I know nothing about Ruth Rendell other than she writes popular mystery novels and is very British. From the sound of the descriptions her other novels might suit my tastes more (i.e., “dark and twisty”). A rich, bratty couple renovating their fancy cottage in London discovers three bodies hidden in a small vault under their house. The “vault” is an unfinished basement that at some point was walled-over. Inspector Wexford is a retired detective who is asked to assist in figuring out this mystery. I was never entirely clear why he was involved as a civilian. Maybe because novelists seem to enjoy resurrecting their retired detectives for a final go. He helps by interviewing random people with minimal connections to the case and through his hard thinking and jaunts across London suddenly all becomes clear. Wexford at one point describes his irritatingly immature daughter this way: “She made exasperation noises, sighs, and the kind of sound that accompanies the casting up of eyes.” This could have easily described me as a reader unfortunately. Wexford uses strange leaps of logic to connect pieces of evidence that serve the goal of the book well (solve the mystery), but don’t ring true to this reader. For example, when they find a piece of paper with a French word and the name Francine they start looking for all the French-speaking women in London named Francine of a possible age range! Really?!? The London police have enough time on their hands to go after this random goose-chase, especially for people who have been dead for two or more years? At one point even Detective Superintendent Thomas Ede, the officer who reached out to Wexford, seems to tire of these random attempts to piece together a puzzle. In the end Wexford wins, but like his daughter, I just truly couldn’t care. The only bright point for me was the description of London. Rendell goes to great lengths to describe the neighborhoods in which Wexford travels. A fan might find it fun to travel Wexford’s path. Not my mystery novel. Might be yours. Check out Wallander first. So, here goes some book reviews for Cannonball Read 4. It is too late to sign up but you can learn all about some books there. My friend recommended this novel to me as a good winter break read. She just told me that it was Swedish and had spy thriller elements. She didn’t tell me that it is the final book in a series of crime fiction starring our favorite Swedish police officer, Kurt Wallander. Needless to say I had no idea it was the final one. I was a bit depressed when I halfway through I finally read the liner notes and realized I had started at the end. But no matter. In the book’s favor I enjoyed it even if it is the last of its kind. When it opens up Wallander’s daughter decides to have a child with a man whose father was a high ranking officer in the Swedish navy. This naval officer, von Enke, indicates to Wallander that he has a story to tell involving high intrigue on the high seas, but soon after he goes missing and Wallander never gets the chance to find out what in the world the guy was talking about. Wallander takes up the mystery at his daughter’s request and soon after von Enke’s wife also goes missing. Obviously I can’t compare this book to the other novels in the series. On its own, it is well worth the read. Generally I’m not a fan of crime fiction, but this book brings in the spy thriller elements that make it more than your run of the mill crime work. It also echos the finer qualities of John le Carre without his tendency toward heavy-handed politics. Actually, Wallander is about as apolitical as you can get, which makes the story even more interesting. He spends his time trying to understand the situation before him, not preaching about it (I’m thinking Constant Gardener le Carre here). The only criticism I would throw out there is that Mankell tends to give information for which I don’t see a purpose, like the couple of times when mid-story Wallander decides to clean out his fridge. Maybe it is his attempt to create reality? I understand that, but it seemed jarring to me at times. I don’t want to give away how Mankell closes the book on Wallander, but I have to give props to his approach. It felt absolutely believable. Read it and you will see what I mean.